We try to go somewhere from time to time, if only overnight, no matter how busy we are. 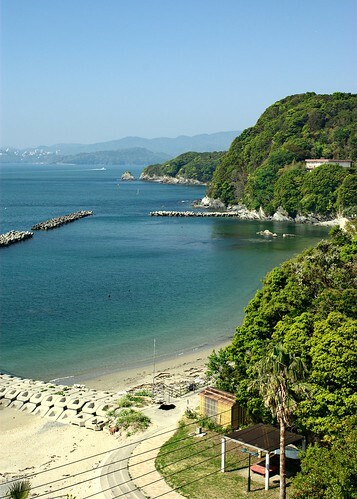 During Golden Week this year we went to Toba and Toshijima island in Mie prefecture. Mie is right on the coast on the eastern end of Kansai - it's not even clear if the area properly belongs in Kansai or in Tohoku - a couple of hours away by train. Mie is probably most famous for Ise, where the main Shinto temple, said to house the mirror used by Amaterasu, resides. We didn't go there; we're not religious, and apparently you don't get to see more than the outer wall of the temple complex anyhow. 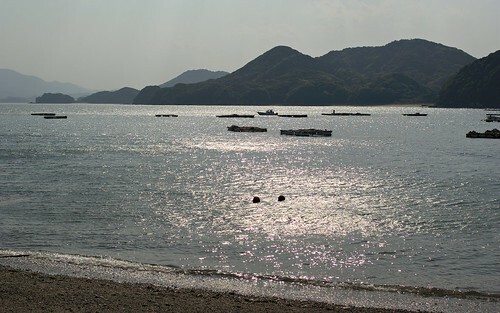 The sea between Toba and Toshijima. 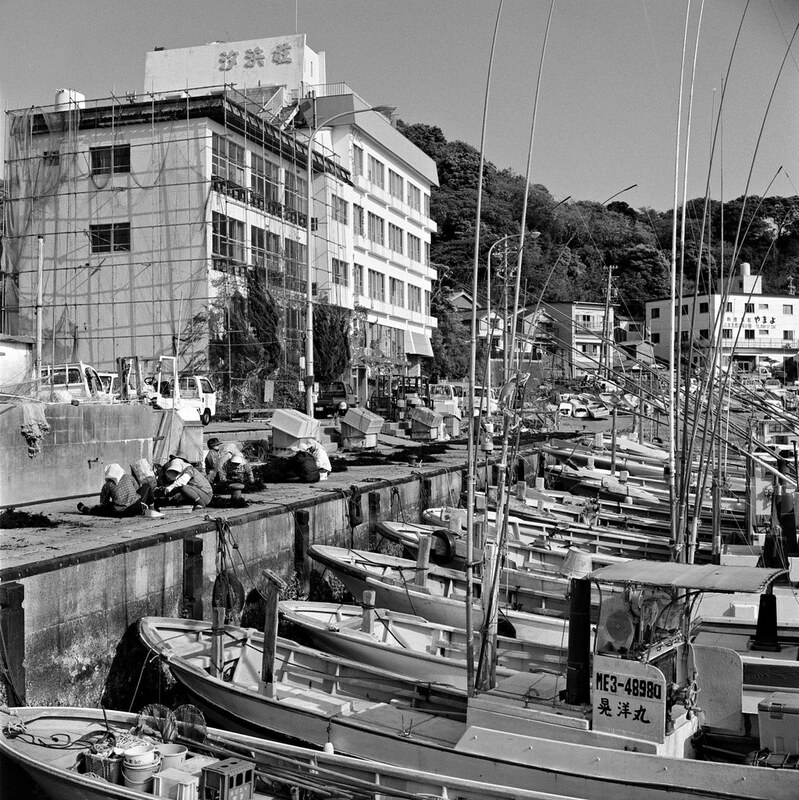 Toba is a coastal city most known for its pearl industry. 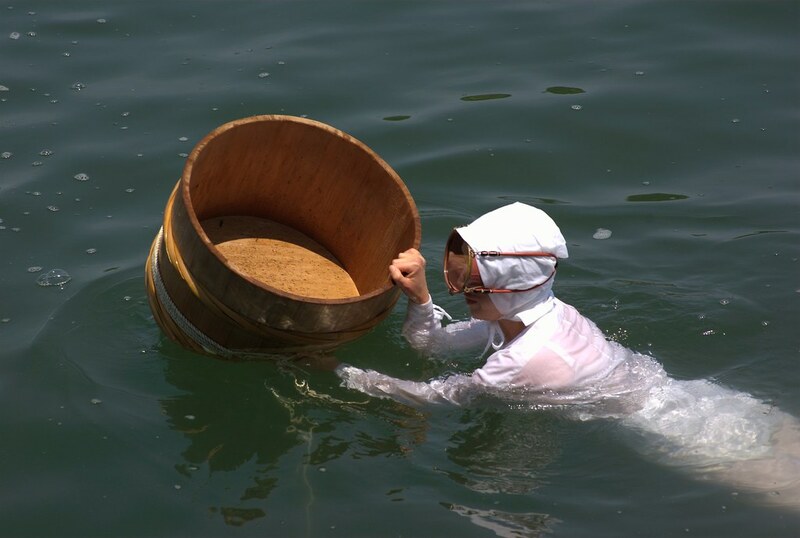 This is where pearl cultivation was first developed, and where Ama, female pearl divers, live and work. 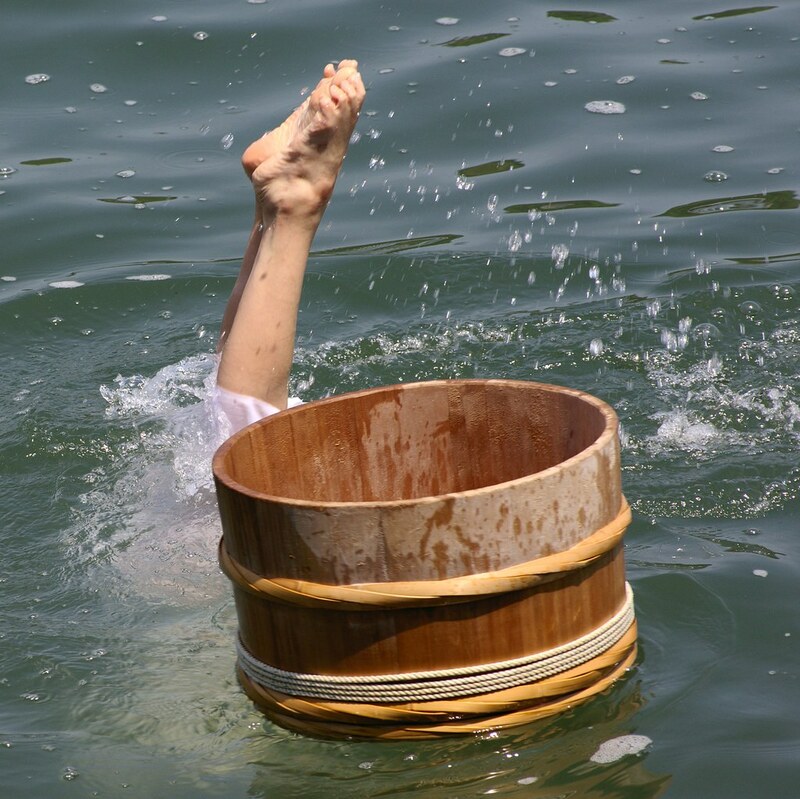 Surprisingly, pearl diving is still a viable business here, with over a thousand local women working as divers at least part time. Why women? They claim they can hold their breath for longer than men. I would hazard a guess that it started as a form of division of labour; with the men away working as fishermen it left the women available to pick up diving. Once the pattern was established, it became tradition. 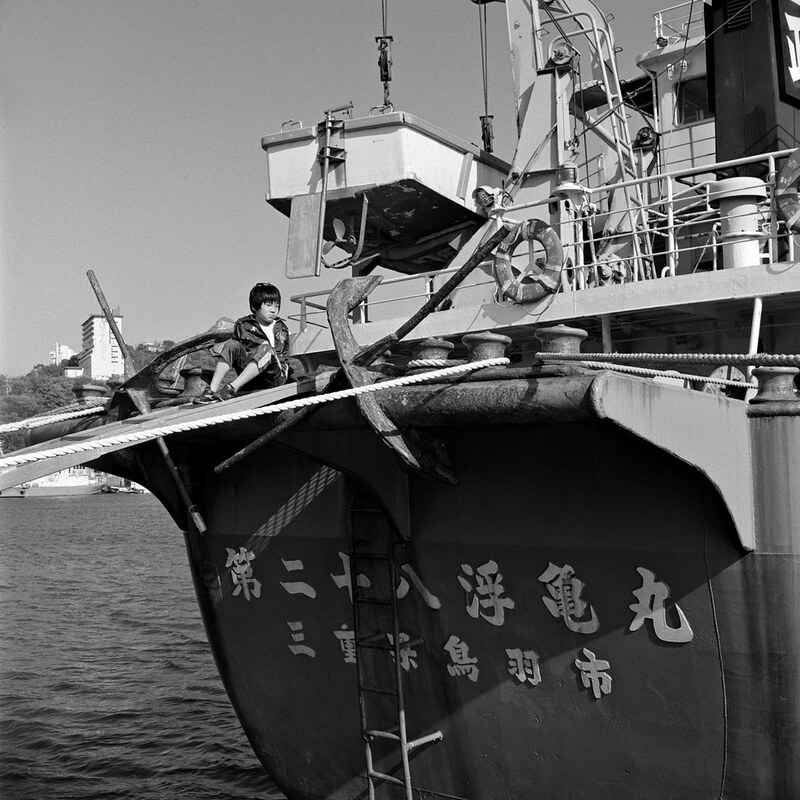 Ama diver during a show at Pearl Island. The show, or display, is fun and informative, and short enough never to drag. The pearl museum is also well worth a visit, with the whole process explained, from oyster types around the world and their pearls, to how to sort and string pearls for a necklace. 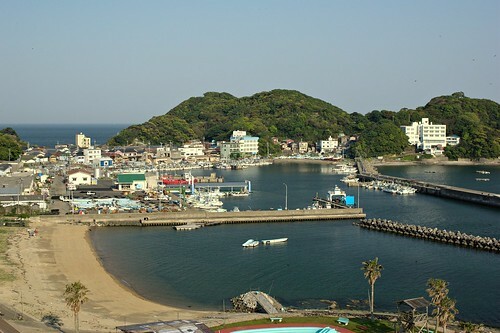 Toshijima is the largest of several islands just off the coast from Toba. You get there by small passenger boats that run from the harbour. 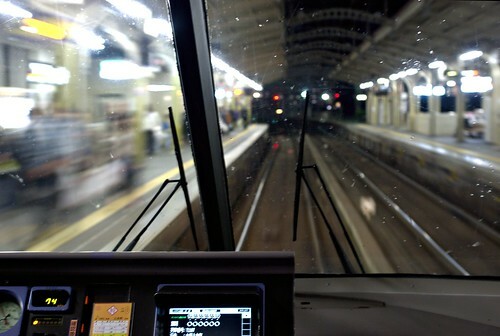 It's not far - the trip takes twenty minutes or so - but you do have to keep an eye on the timetable as they only run every couple of hours or so. There's three or four other islands in the same area, with boats running between them all. 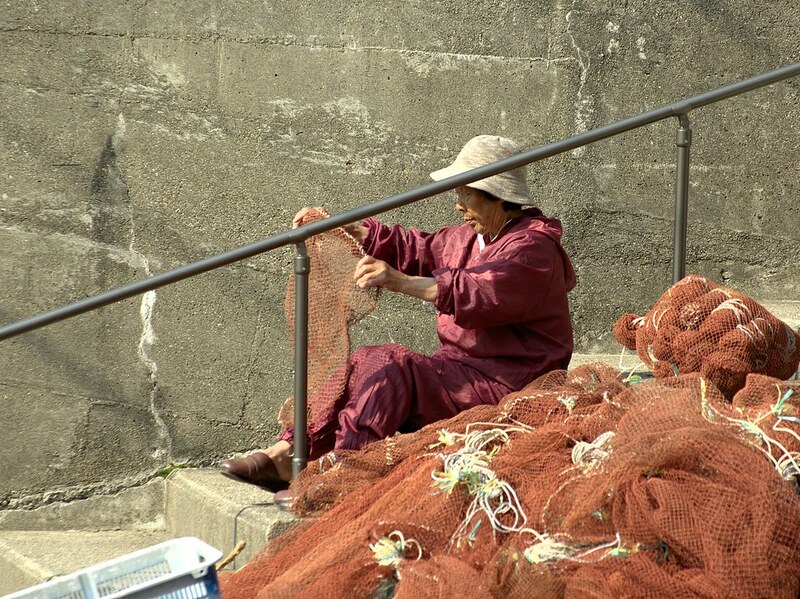 A woman is mending nets by the berths at hte end of the harbour. Women are packing hijiki seaweed on the pier. During season - exactly when we were there - every flat, dry surface on the island is used to dry the seaweed which seems to be a major seasonal product. 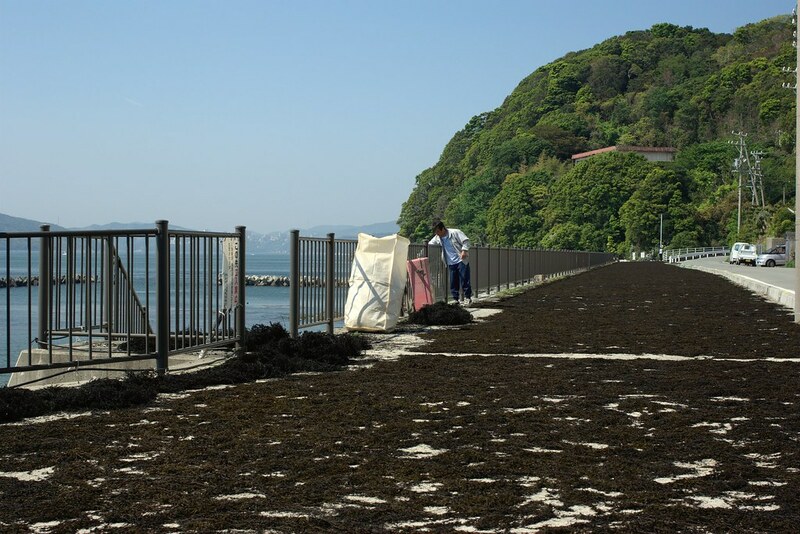 Sidewalks, side streets, stairs, playgrounds - dried seaweed is everywhere. The island seems to mostly live off fishing, though there's a fair amount of ryokan and hotels as well. Toshiijima, like so many places, seems to be a victim of the real estate bubble of the 1990's. 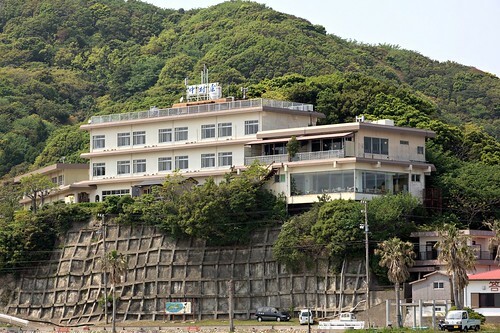 There's plenty of nice-looking ryokan, but a number of disused former hotels as well. I get the impression of a brief holiday boom and bus, followed by a slow decline as the island returned to a sleepy fishing community. As a visitor, I can't say I find it too regrettable though. The slow, languid, relaxed atmosphere really was the highlight of this trip. 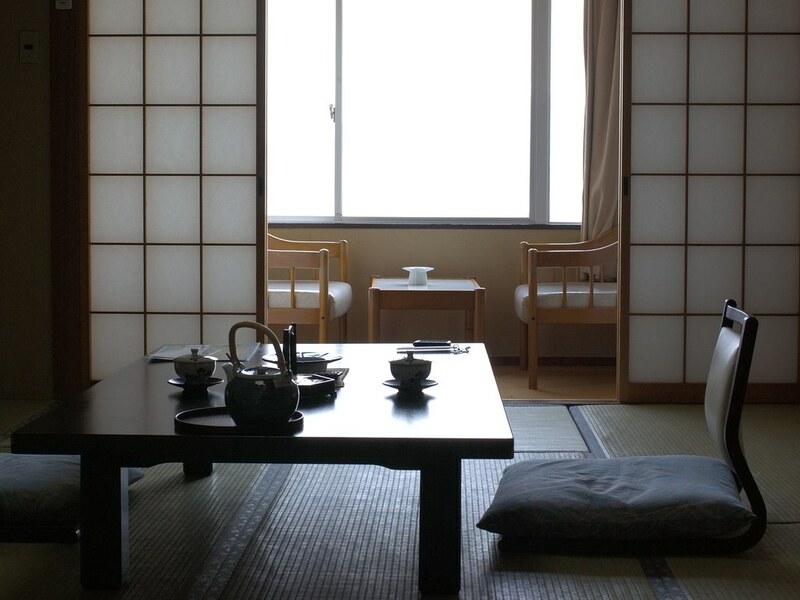 Nakamura ryokan, overlooking the harbour. There's a public sento and private outdoor baths, a sundeck on the roof, and the sandy beach is only just across the road. This seems a great place for quiet beach life. Rooms are all Japanese style. A bit old but clean and well maintained. 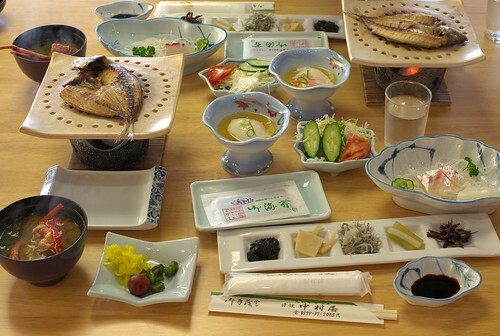 Dinner is served in your room, and afterwards you can sit by the window and follow the lights of the fishing boats. 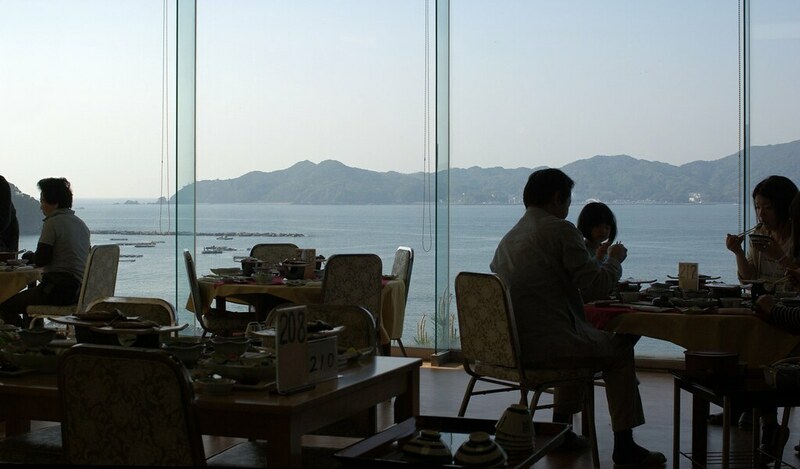 We stayed at Nakamuraya, a fairly large ryokan overlooking the harbour. Old slightly worn building but clean and pleasant. The highlight of the stay is the food. It's all seafood of course, and the dinner was if anything overabundant. Really - the variety and amount was just plain too much for two people. It was all you could to just to taste everything before you were full. There were some truly delicious dishes; they sadly got overshadowed by the sheer amount of other stuff. I would frankly have wished for a dinner with a bit less food and fewer dishes. Breakfast was near perfect. My only regret with Japanese breakfasts is the lack of coffee. Breakfast with a view. The baths are on the next floor, with the same view from the outdoor pool. 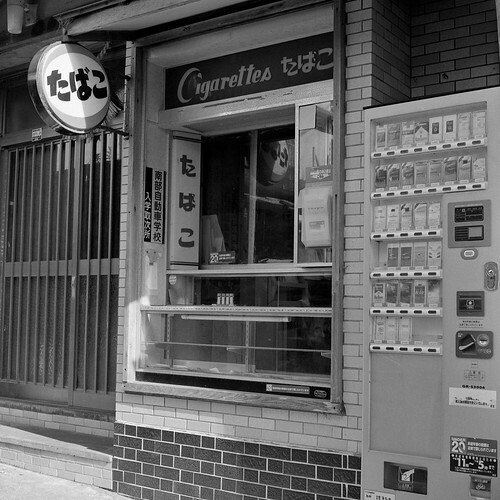 Tobacco shop, Wagu town. This kind of old tobacco shop is rapidly disappearing in most places, but get to survive in sleepy places like this. The sea and Toba seem from our window. Back in Toba we spent an afternoon wandering through the town. It's not very large, and a lot of it is dedicated more or less to the tourist trade. The aquarium seemed to be full of people (we didn't go this time), and many restaurants and shops seemed to do a lot of business too. We had lunch at an Italian restaurant that had enough guests that we had to wait our turn. 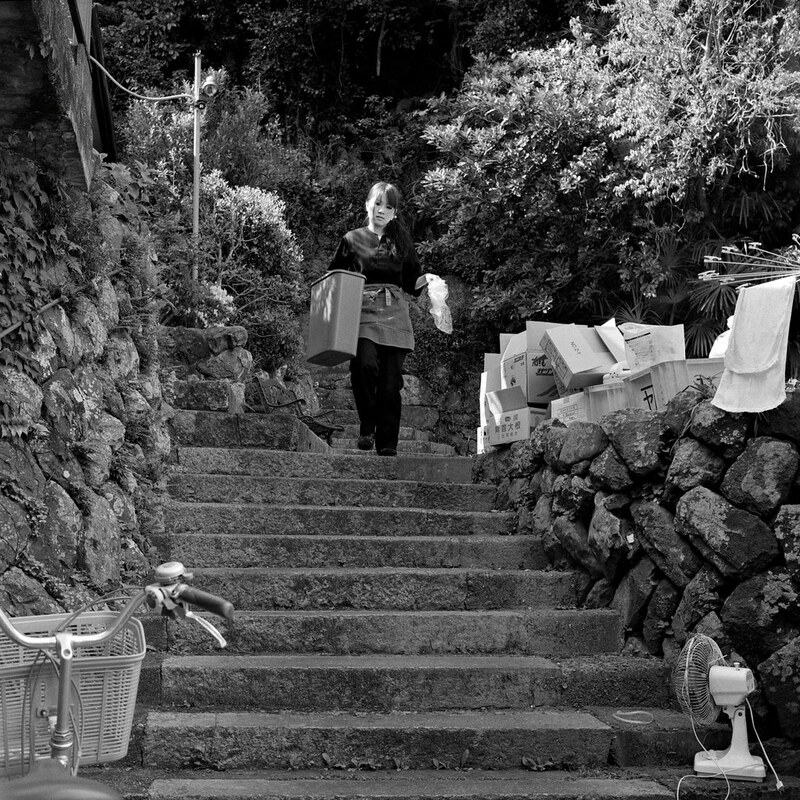 Steep alleyway behind a row of houses in Toba. A restaurant worker is picking up supplies out the back. Takama café, a second-floor café between Pearl Island and the station. 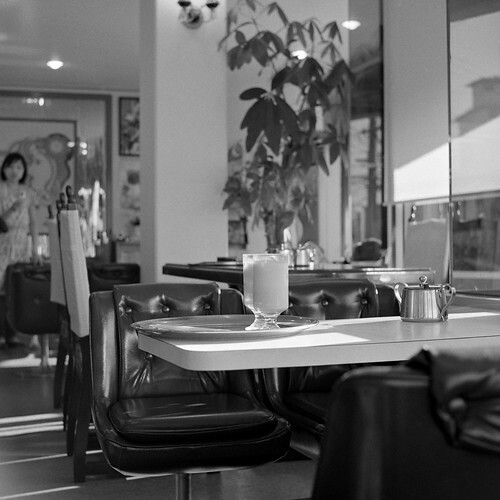 Wonderful atmosphere, good coffee and some seriously tasty ice cream desserts. I wish we could find a café this good in our neighbourhood. A fun bit of this town is that there's lots of tiny museums and such dotted around the center. A local doctor's preserved home and office is displayed fairly prominently near the harbour, and there's a string of small but fun museums commemorating well-known authors from the area further towards the mountain-side. "Good authors" include Edogawa Rampo, a prolific producer of pulp murder mysteries and horror stories of the more improbable kind. Really, the place is worth a look. Crane ship, and a boy was running up and down the gangplank with bottles of soda. I guess his father must work on the ship. Kintetsu Express train, ready for boarding at Toba station. We took the Kintetsu express train from Osaka. 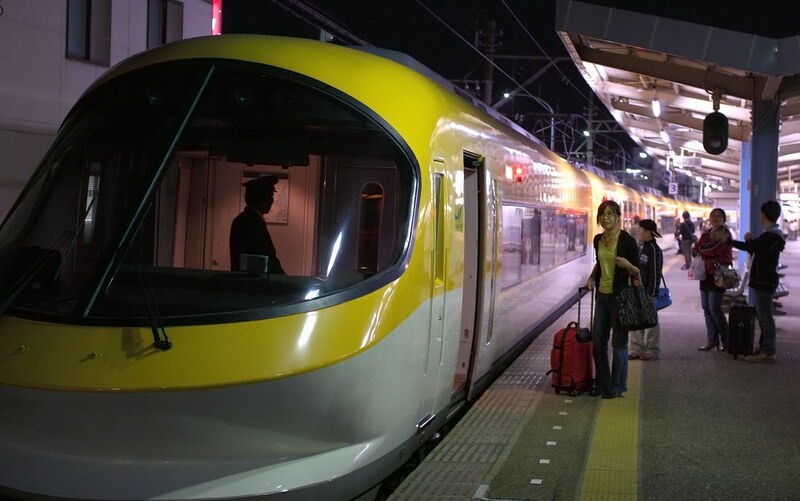 They're fast and comfortable - it doesn't make sense to pay the extra for express service between Osaka and Nara, say, but for this two-hour journey it was well worth it. We had "salon car" seats one way, with facing seat pairs and tables; and first-class the other way (the price difference is small). The first-class seats are more comfortable, and you get to see the panoramic view out the front of the train, something I could never tire of. But overall we both found the salon car to actually be better. The seats are large, and you can sit facing each other with a table for snacks, newspapers and books. It feels cosy and a little private. There's plenty more pictures in the Toba set and the Toshijima set over on Flickr. Rushing back towards Osaka. The panorama window is great. Great shots, I've never stayed in Toba (just stopped in at a small fish market), but Mie's coastal towns really are just gorgeous, huh? One thing I've found (as you noted) is that most towns in that region are quite quiet and laid back, but not to the point of feeling like dead towns - which is refreshing. I went out to 瀬戸内海 this Golden Week, and while the hiking and views are just breathtaking and I wholeheartedly recommend a visit, in most of the towns of Shodoshima (小豆島) you can really notice the economic stagnation. I've lived here in the Osaka area for years now, go to Kobe at least once a month, and to the Seto coast a couple of times every summer, but I have yet to even set my foot on Shikoku or any of the islands around here. It's almost getting ridiculous. We really should go soon; it's not even far away or anything. It does make me wonder: Shikoku and the islands are so close, and they're both beautiful and different from urban Osaka. And yet I (and most Osaka residents) never go there. I wonder why? It just doesn't _feel_ close I guess, and it just doesn't pop in my mind when I think of holiday destinations. I know what you mean - I've encountered the same thing, and wracking my brain I really cannot come up with a good reason why, either. Going there in person, even in the peak tourism season, and finding it extremely quiet was of course a treat for me, but lends further weight to the notion that people just don't really consider going out there. Since a lot of the islands require a ferry ride to be accessed, I think that extra transportation requirement adds an image of "far" into the equation. We ride buses and trains every day, but ferries and planes are unusual, typically for longer trips and such, so maybe that extra leg on the journey holds people back. For reference, traveling as a foot passenger on a ferry in that area is great - generally no reservation required and extremely cheap. Same deal went I went to Yakushima (屋久島) a long while back.